You could hear the group at the homeowner's association meeting yelling, "Hear!Hear!" on the other side of the room when the subject of the fenced-in, round walkway came up. The group wanted a safe place for them to aimlessly walk in circles while playing on their cell phones, without worrying about running into someone or something. Was that too much to ask? 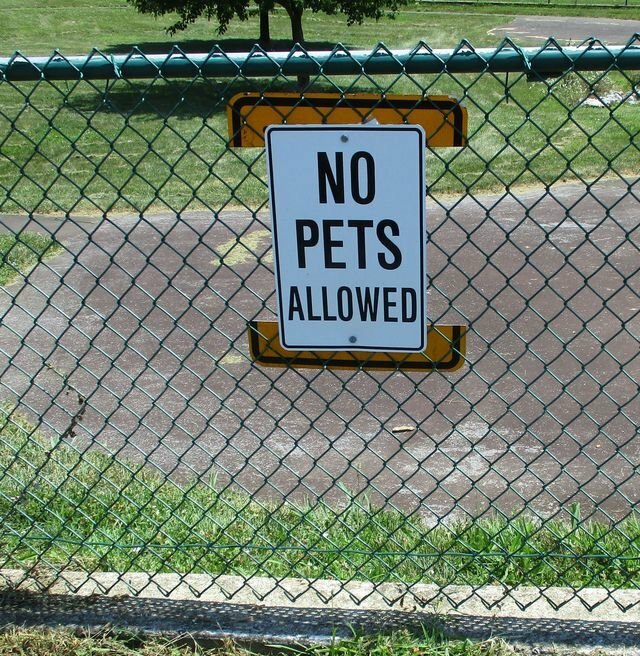 The walkway was built with a fence around it and a sign that read "No Pets Allowed." As far as I am concerned, that group shouldn't have been allowed in the area with their cell phones because they were no different than a dog with a bone. This cute gif is brought to you by @snook. Thank you! haha! howdy Butterfly! Hey this is something you just ripped off in literally 5 minutes right? It's very good and sounds totally conversational and natural, well done! Thanks @janton! I am glad you like it. This one took me 15 minutes which included polishing...correcting grammer, punctuation and subtracting or deleting a few words here and there. That is one of the things that I love about these freewrites. The only real rule is to use the prompt in the freewrite. Howdy again Butterfly! oh so there is no rules hardly! lol. I like to break rules but there's none to break there. you can take hours and make it a prize winning essay. How's it going with you? you still spending your hard earned steem on contest rewards? Howdy again @janton! I gave away my first prize today and began my 2nd week of the Butterfly contest. I hope to get more entries. Where is your bird post? Howdy back Butterfly! What do you give for prizes? an autographed photo? no that wouldn't work with your anonymous lifestyle I guess. I have very few bird pictures or posts so I didn't do one today, maybe next week. did you do one? HaHa! I don't think anyone would want an autograhed photo. I am giving away SBI Shares. The gift that keeps on giving. Yes, I did a bird post. A young robin learning to fly. Guess what? My rep turned 60 today. Yay! yay, good for you! that 59 takes forever to turn into 60, I swear they slow that one down!